Super criminals are planning to infiltrate Earth with mass nuclear destruction. 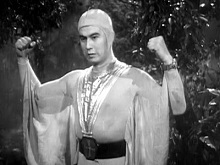 Now it's up to superhero Starman (Ken Utsui) to defend civilization by thwarting the invaders. Also stars Junko Ikeuchi. 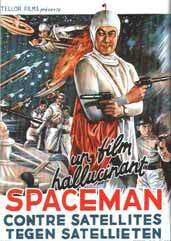 NOTE: This film was edited from two episodes of the S�p� Jaiantsu (1957) serial. The two episodes were originally a complete story with each episode running approximately 50 minutes in length. A monstrous evil brain from the planet Balzaar leads his mutant Marpetians on a crusade to conquer the universe and unleash hideous monsters on Earth that spread deadly diseases. 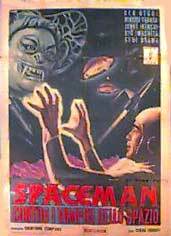 Now it's up to superhero Starman (Ken Utsui) to rescue Earth from the menace of the evil brain, while also battling armies of monsters the brain has sent against him. Also stars Junko Ikeuchi and Minoru Takada.